Kennedy Children’s Center (KCC) is dedicated to providing high quality education services to young children with developmental delays, in partnership with families and communities. We accomplish this through child-centered, evidence-based instruction that prepares each student to enter the New York City public school system in the least restrictive environment possible. We seek to support families with training, guidance, and advocacy, and strengthen our school community through professional development and collaborations with local human service organizations. • Approved by New York State Education Department (NYSED) as a Special Education Preschool. • Approved by New York City Department of Health and Mental Hygiene (NYCDOHMH) as a Day Care provider. • Incorporated in New York State and registered as a 501c3 charitable organization with the IRS. • An affiliated agency of Catholic Charities of the Archdiocese of New York. Learn more about us in our 2018 Annual Report! Established in 1958 as the ‘Kennedy Child Study Center,’ KCC was one of the first schools in the nation to recognize that children with special needs deserve the same opportunities as typically developing children – to learn, grow, and develop their unique abilities. In six decades of service, we have transformed from a small private school established by the Kennedy family and run by the Daughters of Charity, to a DOE-contracted provider serving nearly 400 public preschool students. We continue to draw on our rich legacy while applying the evidence-based practices and differentiated curricula that our founders helped develop. As we enter our next decade of service as the Kennedy Children’s Center, we remain true to the mission that led to our creation: providing high quality education services to young children with developmental delays, in partnership with families and communities. Under the sponsorship of our affiliate, Catholic Charities of the Archdiocese of New York, Kennedy Children's Center continues to fill a critical gap in New York City education. Our preschool is for children from 2.9 to 5 years of age who have been determined as having a significant delay in one or more areas of development. We focus on purposeful play and learning experiences that invite participation, encourage social and emotional relationships, and engage the senses that help children explore their environment. Classes are small, either 8 or 12 children, and are led by NY State certified early childhood special education teachers and two teacher assistants. Goals are aligned with the NY State Pre-kindergarten Foundation for the Common Core. This allows us to differentiate instruction as needed while ensuring that all children are held to the same high standards and expectations as children without developmental delays. If you are a resident of Manhattan or the Bronx and are interested in special education preschool services for your child, you can contact us here. KCC provides Related Therapy Services that include Occupational Therapy, Physical Therapy, Speech-Language Therapy, and Counseling services. 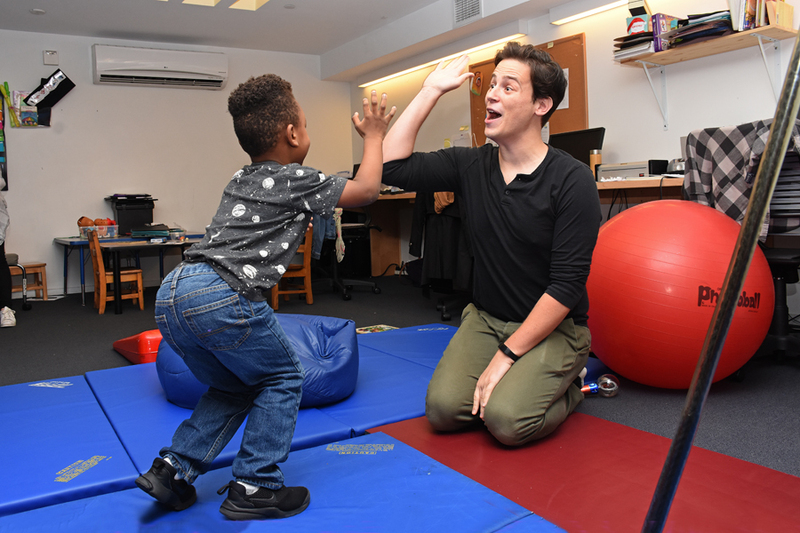 These services are open to children age 2.9 to 5.0 years old who meet the eligibility requirements for therapy set by the New York City Department of Education (NYCDOE), following an initial evaluation and on the basis of ongoing annual assessments. KCC provides related therapy services to nearly 400 preschoolers each year. If you have questions about related therapy services at KCC, you can contact us here. The Kennedy Children's Center is led by a talented group of professionals who bring years of experience in education and nonprofit management to our agency – as well as a passion to help young children and their families. The Board of Directors is comprised of an active group of volunteers who provide their time and talents to oversee the work of the Kennedy Children's Center. The Board’s responsibilities include determining KCC’s mission and purposes, developing agency resources, assessing the agency's management, and advancing KCC’s public image and standing.